PRINCETON, NJ -- March 21, 2002: Two researchers have won an international competition for young physicists, sharing a $15,000 first prize, it was announced Thursday following the Science & Ultimate Reality symposium honoring one of America’s greatest living physicists, John Archibald Wheeler, now in his 91st year. Raphael Bousso, from the University of California, Santa Barbara and Fotini Markopoulou-Kalamara, from the University of Waterloo, Canada shared the top prize. Both work in the area of quantum gravity. They were among 15 finalists, ten men and five women, between the ages of 24 and 32, from eight countries. Six other young physicists, from four different countries, were selected as second place winners, each receiving $5,000. At the symposium, both winning researchers presented work that seeks to unify classical relativity and quantum theory. Dr. Bousso works in the area of black hole physics, string theory and cosmology. Using constructs called light-sheets, he has discovered a fundamental limit on the information content of the universe (measured in bits and bytes). This improves upon similar previous methods derived from black hole physics. It underlies the so-called holographic principle, considered a guide to quantum gravity. Dr. Fotini Markopoulou-Kalamara was recognized for a new formulation of quantum cosmology in which quantum theory is applied to a system that contains its own observers, such as the whole universe. She has also explored the role of causality in the quantum theory of gravity and developed methods to study the relationship between the quantum and classical theories of gravity. Rafael Bousso, 30, was born in Israel and is now a researcher at the Kavli Institute for Theoretical Physics at the University of California, Santa Barbara. His paper was entitled: "The Holographic Principle." Fotini Markopoulou-Kalamara, 30, was born in Greece and is currently a researcher at the Perimeter Institute for Theoretical Physics and an assistant professor in the physics department at the University of Waterloo, Canada. Her paper was entitled: "Models of Planck-Scale Spacetime and Quantum Cosmology." 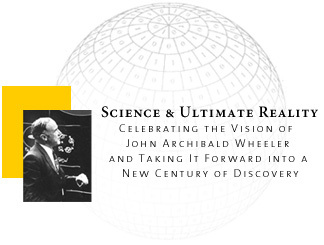 "A highlight of this symposium honoring John Wheeler," said Dr. Kenneth Ford, retired director of the American Institute of Physics and an organizer of the competition, "was the input of brilliant young researchers from all over the world. Some of them will find answers to deep and provocative questions posed by Wheeler over his long career." The John Templeton Foundation and the Peter Gruber Foundation Cosmology Prize sponsored the competition and symposium. Leading scientists gathered for three days in Princeton to honor Wheeler by reporting on topics such as quantum reality, challenges in cosmology, and the emergence of new concepts in complex systems. Nicole Bell, NASA/FERMILAB, Batavia, Illinois, USA. -- Born 12/12/75, Australia. "Coherence, Decoherence and Oscillating Neutrinos – from Quantum Zeno to Getting in Sync." Steven Gubser, Princeton University, USA. -- Born 5/4/72, USA. "On the Connection Between Gauge Theory and Gravity." Olga Khovanskaya, Moscow State University, Russia. -- Born 4/23/77, Russia. "Dilatonic Black Holes in String Gravity and Their Relation with Parameters of the Early Universe." Michael Murphy, University of New South Wales, Australia. -- Born 3/17/77, Australia. "Do the Fundamental Constants Vary in Spacetime." Jonathan Oppenheim, The Hebrew University, Israel. -- Born 11/24/70, Canada. "Bit by It." Mark Topinka, Stanford University, USA. -- Born 4/24/70, USA. "Imaging Flow Through Electronic Wavefunctions." Other finalists, who received all-expense-paid trips to the symposium and delivered short lectures, are Anita Goel, Harvard University; Jiangping Hu, Stanford University; Jeremy O’Brien, University of Queensland, Australia; Jianwei Pan, University of Vienna, Austria; Mary Rowe, National Institute of Standards and Technology (USA); Andre Stefanov, University of Geneva, Switzerland; and Vlatko Vedral, Imperial College, London, UK. The John Templeton Foundation was established in 1987 by the international investor Sir John Templeton to encourage an appreciation of the interdependence between science and medicine and the moral and the spiritual dimensions of life. Through its grantmaking and project support, the Foundation seeks to stimulate a high standard of excellence in scholarly pursuits that can help define and explore the human potential within a scientific context. The Foundation currently funds more than 250 projects, studies, award programs and publications worldwide. The Cosmology Prize of the Peter Gruber Foundation recognizes individuals who have contributed to the fundamental advances in the field of cosmology. The purpose of the Prize is to acknowledge and encourage further exploration in a field that shapes the way the universe is perceived and comprehended.